Saturday, January 12, 9:00 a.m. to 4:00 p.m.
Saturday, January 26, 9:00 a.m. to 4:00 p.m.
Saturday, February 2, 9:00 a.m. to 4:00 p.m.
Saturday, March 2, 9:00 a.m. to 4:00 p.m. This course offers an overview of wellness related issues and practices in education. It will examine the causes and implications of challenges that educators face in terms of personal and professional well-being, while exploring solutions. It will take a personal and experiential approach; offering practical, preventative, and transferable strategies and skills. Specifically, the course explores an Indigenous framework for well-being, as well as two therapeutic models for trauma-informed care. This course is an elective in the General, School Counseling, and Special Education streams. Dates and Times: Tuesdays, January 8 to April 2, 5:30 p.m. to 8:30 p.m. This course will explore theoretical understandings of project-based learning — that is learning through authentic, inquiry-based, and rigorous teacher and learner-led learning experiences. As a learning community, participants will examine a variety of conceptualizations of project-based learning, they will deconstruct what we mean by a project, and they will investigate how we create school cultures based on projects. This course will also focus on practical implications of PBL, including assessment, the conflict between inquiry and competencies, accessibility for all learners, and engaging educators within your school. This course is an elective in the General, School Counseling, and Special Education streams. Monday, January 14, 6:00 p.m. to 9:00 p.m.
Saturday, January 19, 8:30 a.m. to 4:30 p.m.
Saturday, February 9, 8:30 a.m. to 4:30 p.m.
Saturday, March 2, 8:30 a.m. to 4:30 p.m.
Saturday, March 16, 8:30 a.m. to 4:30 p .m. Monday, March 18, 6:00 p.m. to 9:00 p.m. This course provides an overview of the fundamental theories of school counselling including: the contexts of effective treatment systems, person-centered therapy, existential and gestalt therapy, emerging counselling approaches, rational emotive behavioural therapy, action-focused therapy, reality and behavioural therapy. Also considered are values, objectives, ethical issues, and the counsellor-student relationship. Throughout, emphasis is placed on practical counselling strategies for early, middle, and senior years levels. Through lectures, readings, class activities, discussions and video clips, students learn about the fundamental components of the major theories, examine differences and similarities amongst the various approaches, and consider practical issues that school counsellors face. This course is a Core course in the School Counseling stream, and an elective in the Special Education stream. 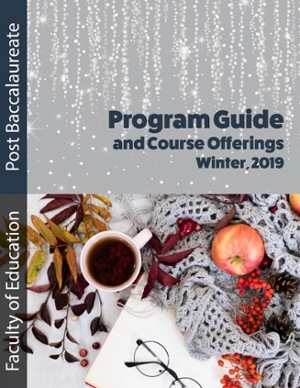 The practicum in school counselling provides an opportunity for students to synthesize the theoretical information on individual counselling and group counselling from their coursework and apply it in an early, middle, or senior years school setting. The course provides both a laboratory experience and a field experience under the joint supervision of a U of W supervisor and a site supervisor. The school counselling practicum is designed to assist students in learning the function and procedures that accompany the role of a school counsellor through observation, shadowing, and reviewing relevant documentation. Students are required to conduct online lab sessions and class discussions throughout the practicum. Students are expected to complete a minimum of 100 hours at the practicum site. a grade of B or higher in EDUC 5426 School Counselling Practicum Skills demonstrated evidence of professional behaviour and ethical conduct. Additional Information: Field placements are limited and placements will only be arranged by the Faculty of Education Placement Coordinator. Students may not complete their practicum in the same school division, or during the same hours, in which they work. Students registering for this course require permission from the Faculty of Education. We are unable to accept visiting students from other universities/programs into this course. Practicum Fee: Students enrolling in this course will be assessed a practicum fee of $300.69 in addition to regular course tuition. This is a core course in the School Counseling stream. Wednesdays, 5:30 p.m. to 8:30 p.m. This course introduces students to approaches and assessment techniques relevant to effective crisis and trauma work with early, middle, and senior years students. Topics include strategies for prevention, intervention, and postvention; Western-based trauma discourse and counter-discourse; gender, colonization, and trauma; suicidal crisis; crisis related to body image, fat prejudice, and eating difficulty; anti-violence resistance and community building; “belonging” students; and self-care. This course is an elective in the General, School Counseling, and Special Education streams. Saturday, February 9, 9:00 a.m. to 4:00 p.m.
Saturday, March 16, 9:00 a.m. to 4:00 p.m. This course provides a more in-depth look at some of the topics covered in Inclusive Education I. Specifically, assessment, service delivery systems, and individualized educational and behavioral programming are examined in detail. We will also examine pragmatic issues such as reporting procedures and applying for special needs funding. The topics of classroom management and meeting the needs of at-risk children and youth will be introduced. Prerequisite: EDUC-5440 Inclusive Ed 1. This is a core course in the Special Education Stream. Students in the General stream can take this course as long as the prerequisite has been met. Saturday, January 12 9:00 a.m. to 4:00 p.m.
Saturday, January 19 9:00 a.m. to 4:00 p.m. p.m.
Saturday, January 26 9:00 a.m. to 4:00 p.m. p.m.
Saturday, February 2 9:00 a.m. to 4:00 p.m. p.m.
Saturday, February 9 9:00 a.m. to 4:00 p.m. p.m.